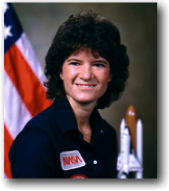 NASA has named the site where twin agency spacecraft impacted the moon Monday, Dec. 17, in honor of the late astronaut Sally K. Ride, who was America’s first woman in space and a member of the probes’ mission team. The formation-flying duo hit the lunar surface as planned at 2:28:51 p.m. PST and 2:29:21 p.m. PST at a speed of 3,760 mph (1.7 kilometers per second). The location of the Sally K. Ride Impact Site is on the southern face of an approximately 1.5-mile-tall (2.5-kilometer) mountain near a crater named Goldschmidt. This mission development is an excellent companion to the NASA Explorer Schools featured lesson, Engineering Design Process: On the Moon: On Target. To access this lesson, visit the NES Virtual Campus. For more information about the GRAIL mission visit https://www.nasa.gov/mission_pages/grail/news/grail20121217.html. As part of a series of electronic professional development experiences for educators, the NASA Explorer Schools project and the National Science Teachers Association are hosting a 90-minute live professional development Web seminar for educators on Dec. 19, 2012, at 6:30 p.m. EST. This Web seminar will introduce the Forces and Motion: Balloon Aerodynamics Challenge for students. This activity provides firsthand information about density, neutral buoyancy and drag, which is then used to solve a problem. The activity provides many opportunities for incorporating national mathematics, science and technology learning standards into your curriculum. This seminar will be repeated on Apr. 17, 2013. NASA is so sure the world won’t come to an end on Dec. 21, 2012, they have already released a video and news item for the day after. According to media reports of an ancient Maya prophecy, the world was supposed to be destroyed on Dec. 21, 2012. The truth, says Carlson, is more interesting than fiction. To learn more, watch the video below or visit http://science.nasa.gov/science-news/science-at-nasa/2012/14dec_yesterday/. NASA’s Johnson Space Center in Houston is accepting applications from teams of kindergarten, elementary and secondary school teachers to conduct scientific experiments aboard the agency’s reduced gravity aircraft next year. Seven teams, each composed of four to five educators from a single school or school district, will be selected to participate in Micro GX. The unique academic experience includes scientific and inquiry-based research, experiential learning during the reduced gravity flight, and education/public outreach activities. Interested educators are encouraged to apply at http://microgravityuniversity.jsc.nasa.gov/tfs. On Oct. 14, the lunar twins of NASA’s Gravity Recovery and Interior Laboratory (GRAIL) mission, Ebb and Flow, each completed a rocket burn that sealed their fate. The burns modified the orbit of the formation-flying spacecraft, carrying the twins lower and lower over the moon’s surface. On Monday afternoon, Dec. 17, at about 2:28 p.m. PST, their moon-skimming will conclude when a portion of the lunar surface – an unnamed mountain near the natural satellite’s north pole – rises higher than their orbital altitude. The maneuvers began on Oct. 14 at 7:07 a.m. PST when the Ebb spacecraft fired its main engines for 55.8 seconds, changing its orbital velocity by 10.3 mph (4.6 meters per second). Sixteen seconds later, still at 7:07 a.m. PST, the Flow spacecraft began its maneuver, executing a burn 55.4 seconds in duration with a resulting change in orbital velocity of 10.3 mph (4.6 meters per second). The spacecraft were named Ebb and Flow by elementary school students in Bozeman, Mont., who won a nationwide contest. For more information visit https://www.nasa.gov/mission_pages/grail/news/grailstatus20121214.html. Web Seminar for Educators: Mars Exploration–Is There Water on Mars? As part of a series of electronic professional development experiences for grades 9-12 educators, the NASA Explorer Schools project and the National Science Teachers Association are hosting a 90-minute Web seminar on Dec. 17, 2012, at 6:30 p.m. EST. “Chemistry of Water: Mars Exploration – Is There Water on Mars?” is an inquiry-based lesson on how atmospheric pressure and vapor pressure affect the boiling point of water. See why the boiling point of water is pressure-dependent, rather than temperature-dependent. Then, by extension, you will deduce if there could be liquid water on Mars. This seminar will be repeated on March 12, 2013. For more information and to register online, visit http://learningcenter.nsta.org/products/symposia_seminars/NES3/webseminar18.aspx. Technology and Design: The Future of Space Exploration is now available on the NES Virtual Campus. In this episode of NASA Now, John Connolly, deputy manager of the Exploration Missions and Systems Office, describes the difficult planning process, the importance of setting requirements, and the engineering design process necessary to make space missions happen. He also details the physics and environmental differences engineers must consider when designing exploration missions to destinations in space. The NASA Explorer Schools project and the National Science Teachers Association are hosting a 90-minute professional development Web seminar for educators on Dec. 13, 2012, at 6:30 p.m. EST. For more information and to register online, visit http://learningcenter.nsta.org/products/symposia_seminars/NES3/webseminar17.aspx. The annual Geminid Meteor Shower is set to peak on Dec. 13 and 14, 2012. The display, which is caused by an unusual ‘rock comet,’ could produce more than 100 meteors per hour during the dark hours before dawn this Thursday and Friday. In this NASA Now classroom video, John Connolly, deputy manager of the Exploration Missions and Systems Office, describes the physics and environmental differences engineers must consider when designing crewed exploration missions to destinations in space. Preview this NASA Now video below.